"No photos! No California rolls! No noodles!" There are a lot of signs posted around Hama telling you what not to do, but here's what you should do: get here early. Or at least be prepared for a wait. 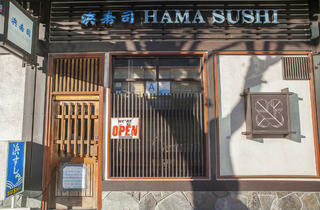 The tiny sushi resturant in Little Tokyo has around 20 seats and fills up fast. Once you're seated, dive in and start ordering (first-timers can always ask for a menu and mark down their picks). Eel and Santa Barbara uni are two excellent choices, while the blue crab hand roll avoids some common pitfalls (too much mayonaise, soggy seaweed) and is instead light, crisp and filling. It can be slightly intimidating for newbies here—the service isn't exactly warm—but order with confidence, take your time and enjoy the chefs' handiwork. 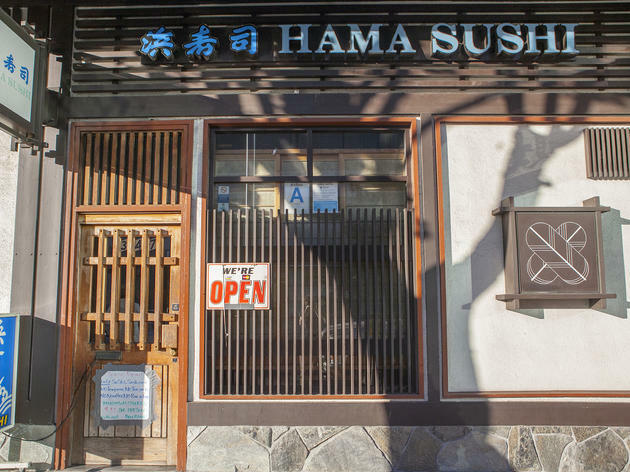 It can be a little intimidating, at first, to visit Hama Sushi, especially if you're by yourself. You will probably be seated next to a stranger, even when there is plenty of other seating in the restaurant. If you're familiar with certain cuts and know what you want, feel free to ignore the menu and just order straight with the chefs behind the bar, who will check in with you throughout your meal. If you're not sure, scan the menu before marking off your order with a pencil - the eel is outstanding, as is pretty much everything available to try here. No photos, though - you'll definitely be scorned for attempting a shot.